The Common House Spider is a species of spider known by the scientific name Parasteatoda tepidariorum . It is found almost anywhere in the United States, and harmless to humans. It is most readily identified by its transparent legs with brown spots on them. Although this spider is mostly thought to be a nuisance, it is almost always good to have in the home because it usually kills off the invading insects that could be carrying diseases. The house spider is found all over in United States. They can grow from 6mm to 2.5cm and can differ from many colors, but they all have a certain hue which allows them to blend in with their environment. They have black spots on their hind legs which can help you identify the spider. Their size and color helps them blend into their environment. The common house spider is similar to the black widow spider in body design. The house spider also has a very hairy body which makes is easy to identify. There is also a small x shaped structure on the back of the spider which is one of the reasons why it is close to the widow spider. It also does not only have black spots on its legs, but it also has transparent stripes between each of the spots. The house spider, even though it can bite frequently inside the house, it is very unlikely to cause any harm and is about as poisonous as the sting from a bee. The house spider can live from one day all the way up to one year. The female house spiders lay a large amount of eggs in the end of the summer and wrap their eggs in a sort of pouch called an egg sac. Each egg sac that the house spider has can contain from one hundred to 400 eggs and more. A single house spider can have up to 17 egg sacs in her life time. The hatchlings stay in the egg sac for several days and then leave and are not cared for by the mother at all. Once the hatchlings are born they undergo a sort of simple metamorphosis,and as it grows the spider will molt and shed its cuticle. The house spider will then go through out its life eating and repeating this cycle throughout further generations and then the spider will die. The Common House Spider can be found all over America, but in few other places in the world. It is most common for its appearance and its friendly and non toxic bites. The Common House Spider is usually found in either dark places in your house, small corners,and cupboards etc. The spider will not bother or bite a human unless the human either gets to close to the spider, messes with the spider starts to mess with its web or try to trap the spider. Even though spiders may be a sort of scary animal, They are usually more of a help then a threat. The reason that the Common House Spider is more of an help then a threat is because it will kill insects that may try to invade your house. They even will stop insects from destroying your flowers, and plants. The Common house spider is also good for your health knowing that the insects that it preys on could be carrying a disease which could be harmful to humans. The venom from some spider bites are also being experimented on and are it is said that they could prevent strokes and heart attacks. The Common House Spider is not only helpful in the house though. It also helps prevent the amount of insects in the world in total by doing its bit inside the house. Their web is also being experimented on to be used as a material in scientific machines. So next time you see a spider think twice before your smash it. 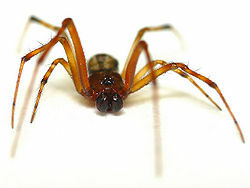 'Parasteatoda tepidariorum. Web. (December 4th 2012). Spiders in the home. Web. (December 4th 2012). Common House Spider - Parasteatoda tepidariorum (December 4th 2012). This page was last modified on 19 January 2016, at 16:47.